Position parts for the operator to pick and place in a work cell of a high volume-machining center. High-speed power turntables are commonly used in high volume machining centers. 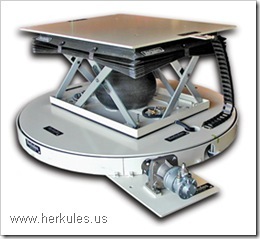 For this application the turntable has a high speed scissor lift table mounted on the deck. The combination of the high-speed rotation of the turntable and the high speed vertical travel of the scissor lift table ensures that the machining center runs at maximum efficacy. The high-speed work cell power turntable helps to minimize the operator’s movements when loading and unloading the parts from the machining centers. Thus the optimal ergonomic movements are achieved. The speed of the power rotate can be as fast as 8 seconds for 180 degrees and the speed for the scissor lift table can be as fast as 5 seconds up and 5 seconds down. High speed power turntables are used at a variety of machining centers such as; milling, turning, burning, and grinding. If you are designing, a laying out of a work cell for a machining center then a high speed power turntable will help you to increase your output. This entry was posted in Lift Table Projects and tagged Ergonomic High Speed Power Turntable with Lift Table by adminenkon. Bookmark the permalink.